Confirmed – BBC TV London News 6.30pm TUESDAY 24 September for the news item on what is happening in Peckham. To add to the conversation on this, let’s know what you think. @lot9peckham designers’ market; artefacts, food + morehttp://lot9peckham.tumblr.com/ last weekend of 4. Number 9 Blenheim Grove. Don’t miss it. Peckham Vision‘s mobile exhibition is there with the Public Conversation about Peckham Rye station site redevelopment. Come, contribute, and enjoy. Have you signed the petition for public toilets in Rye Lane? We joined up with the Rye Lane Traders’ Association for this petition and aim to present it to the Peckham Community Council 30 September. 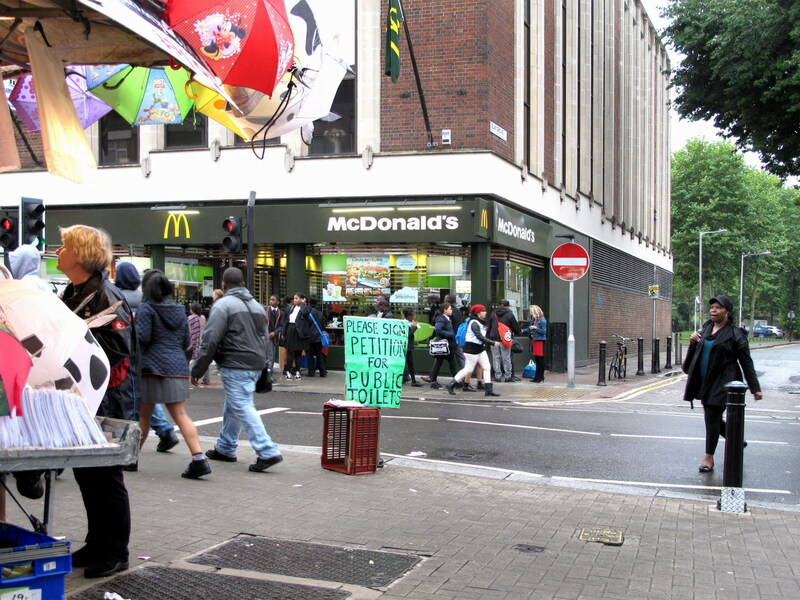 The petition is available for signature at the market stall in front of the cinema opposite McDonalds on Rye Lane, see photo. PECKHAM RYE FÊTE – this coming Saturday 7th Sep. This is one of the best community fairs in the neighbourhood. Not to be missed! Peckham Vision stall will be there as usual. Just drop in from midday and see the mobile exhibition about Peckham town centre. Find out the latest about the station developments, and add your ideas to the discussions about them – http://www.peckhamvision.org/wiki/Peckham_Rye_Station – and other town centre matters. Enjoy the day out with the children, the dogs, the fun and games, the great food and everything! So much to enjoy in a great community atmosphere.